Want to know what it’s like to live with a wolf? It’s a well-known fact that dogs, including the Wolamute crossbreed, descended from wolves and, over time, because of our number one domesticated companions. But, did you know there are still some breeds out there that have a wild side? We call these Malamute Wolf Hybrids and Malamute Wolf Mixes. 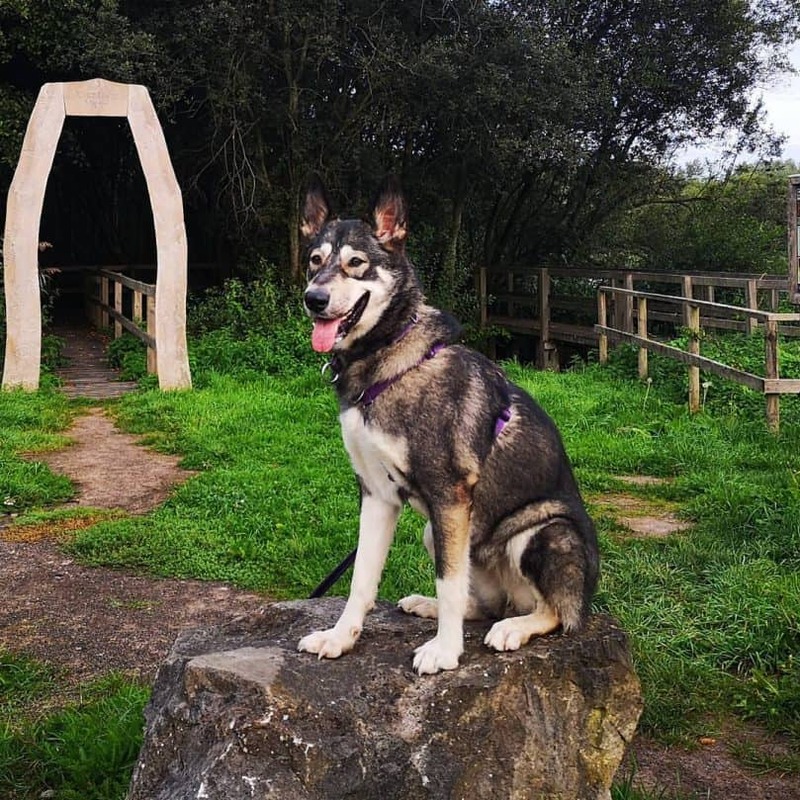 I put this article together to explore the Wolamute (a mix of the Alaskan Malamute and a timber or grey wolf) versus the purebred Malamute. Just how tameable are these creatures? We’re about to find out! Can You Tame The Wild Wolamute? Ready To Take This Dog Home? The Alaskan Malamute often gets mistaken for the Alaskan Husky or Siberian Husky due to their similar Working Group duties and color markings. The oldest breed of the sled dogs, the Alaskan Malamute has a deep chest with a strong well-muscled body designed for pushing and pulling humans across the ice. A purebred only comes in one coat variation: white and grey with tints of black of its back. Their thick fur is always dense and long to protect them from the cold. A full-grown Alaskan Malamute reaches a height of 22 – 26 inches (56 – 66 cm) and a weight of 71 – 95 pounds (32 – 43 kg). It is considered a large-sized breed. As for any health illnesses, the Alaskan Malamute is prone to elbow dysplasia, knee issues, and osteochondritis (inflamed joints or bones). The biggest medical concern to worry about is cataracts, a serious eye issue that can lead to blindness if left untreated. The lifespan of an Alaskan Malamute is 10 – 12 years. The wolfdog is defined as a canine that’s a cross between a domesticated dog and one of the wolf species — there for four. There are only two wolfdog breeds recognized by the Federation Cynologique Internationale, the largest international kennel club. That’s the Czechoslovakian Wolfdog and the Saarloos Wolfdog. It be can be extremely difficult to separate wolfdogs from actual wolves as they have similar appearances and genetics. The only well to tell is by phenotyping, a method that involves observing the animal’s physical traits. The pointy ears and dark and light grey markings of the wolf are almost always passed onto wolfdogs. A full-grown wolf weighs between 51 – 180 pounds (23 – 81.5 kg) and stands at 2 – 3 feet tall (61 – 91 cm). In the wild, a wolf only lives 6 – 8 years. It’s the “eat or be eaten” rule out there. Not to mention, wolves are susceptible to over 100 diseases and parasites, including roundworm, tapeworm, and cataracts like the Alaskan Malamute. It’s not an exact science, but we can make a few predictions about the Wolamute based on its parent species. The height of a Wolamute should be around 22 – 36 inches (56 – 91 cm) and it should weigh between 71 – 180 pounds (32 – 81.5 kg). Both of the Wolamute’s parents’ coat colors have light and dark grey markings, occasionally mixed with black and white. This cross-breed has pointy ears, a medium-length narrow snout, and thick, long-haired fur. 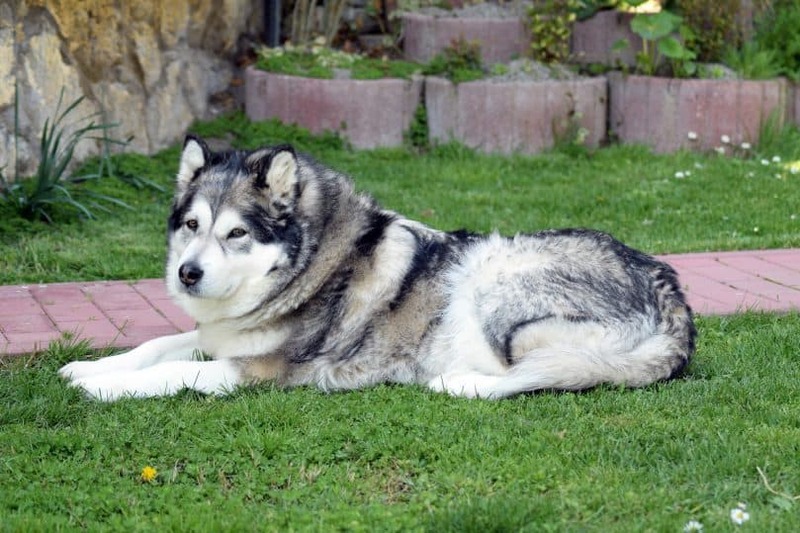 The most common health issue in the Wolamute should be cataracts like the purebred Alaskan Malamute and wolf. The Wolamute is expected to have a lifespan of 10 – 12 years. No one really knows how long wolves can live in captivity. The personality of a wolf is hard to say, but their intelligence as hunting animals is incredibly high. It has a high intuition and powerful instincts. The temperament of the Alaskan Malamute is loyal, friendly, and affectionate. Despite its big size, it’s a very loving and sweet-tempered dog. A member of the Working Group, the Alaskan Malamute is naturally strong, intelligent, and watchful. 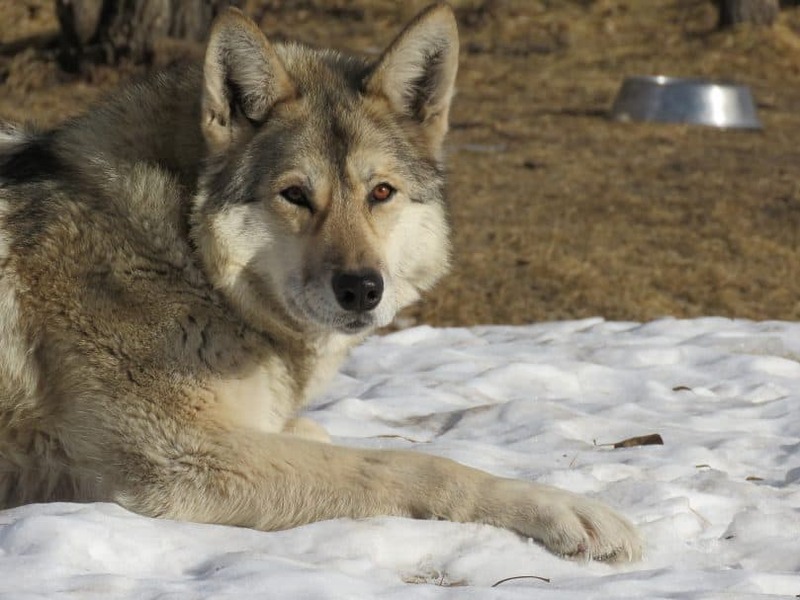 It was bred to assist man, which makes this purebred an excellent companion that’s obedient and loves to serve… but the wolf has highly unpredictable behaviors. And let’s be real, a wolf would never follow commands from a human. Sit, stay, and roll over doesn’t work on this species. As we’ve seen on countless National Geographic shows, the wolf if naturally territorial, protective of its pack, and aggressive when threatened. It must fight to survive. To stop these undesirable wolf-like behaviors, the Wolamute requires firm and consistent training every day to control any combative urges. The Wolamute needs constant mental and physical stimulation, otherwise, it can get destructive and destroy the house. It’s also wise to socialize this crossbreed as soon as possible with other animals and people. 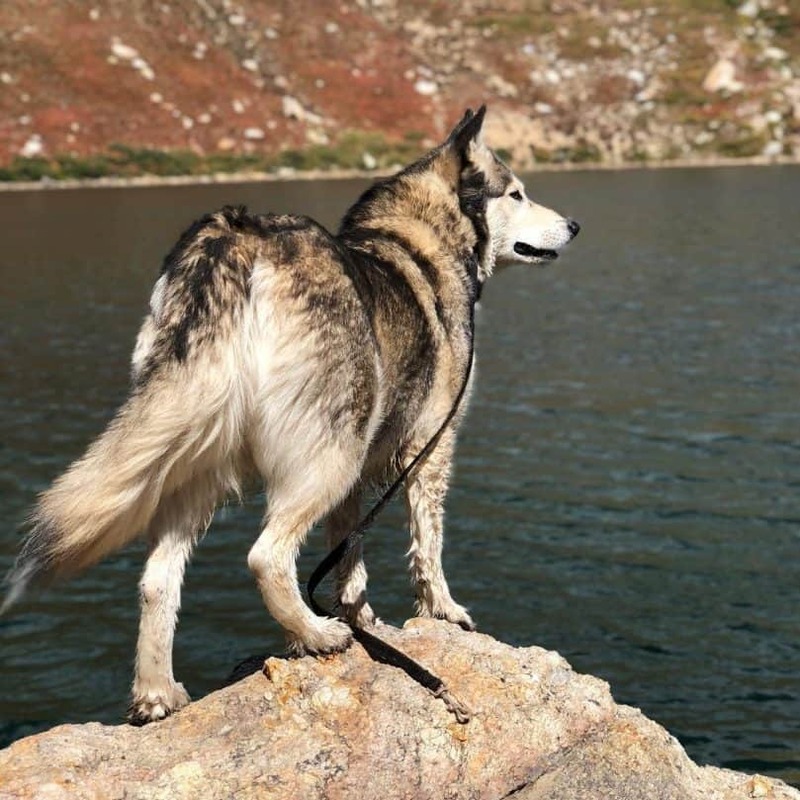 Both the Alaskan Malamute and wolf have long, thick coats that require daily brushing in the Wolamute. NEVER trim this mix’s double-coat. Instead, use a carding tool that safely removes excess hair from its undercoat. On the bright side, Alaskan Malamute fur is entirely odorless so it won’t leave behind any unwanted smells. 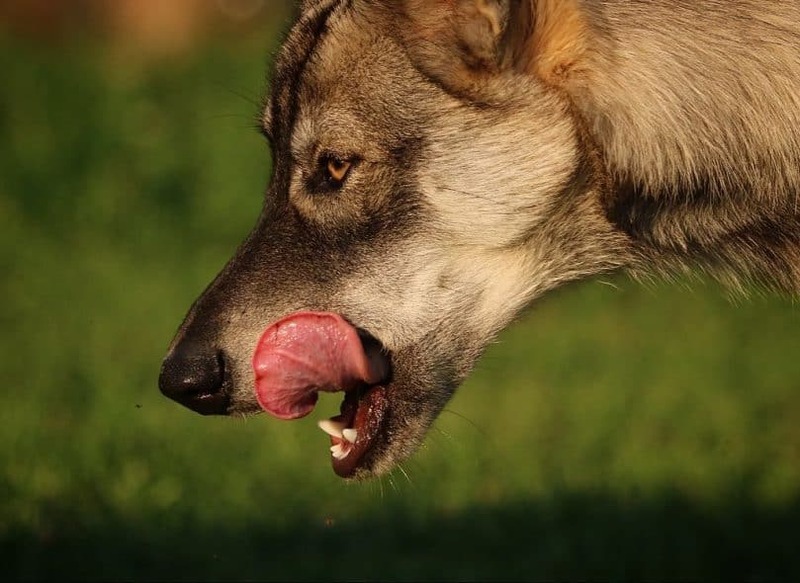 Feeding a Wolamute can get a little pricey as it requires 4.5 – 6 cups of dry dog food a day, divided into two meals. To keep this crossbreed happy and entertained, it needs to be working most of the time, which includes playtime. The Alaskan Malamute would much rather perform heavy pulling or pushing duties than run around aimlessly at the dog park. It’s less playful at the park as there’s no work involved. The Wolamute does best with 1 ½ – 2 hours of strenuous exercise a day. It loves hiking and participating in agility classes. Watch this video to see just how cute Wolamute puppies are and the kind of condition they should live in outside. The price of Woluamute puppies ranges from $800 to $2500. The more expensive, it’s likely more wolf genes are mixed in. If you’re interested in purchasing this dog from a breeder, check out Harvest Moon Malamutes and Wolf Husky Pups. 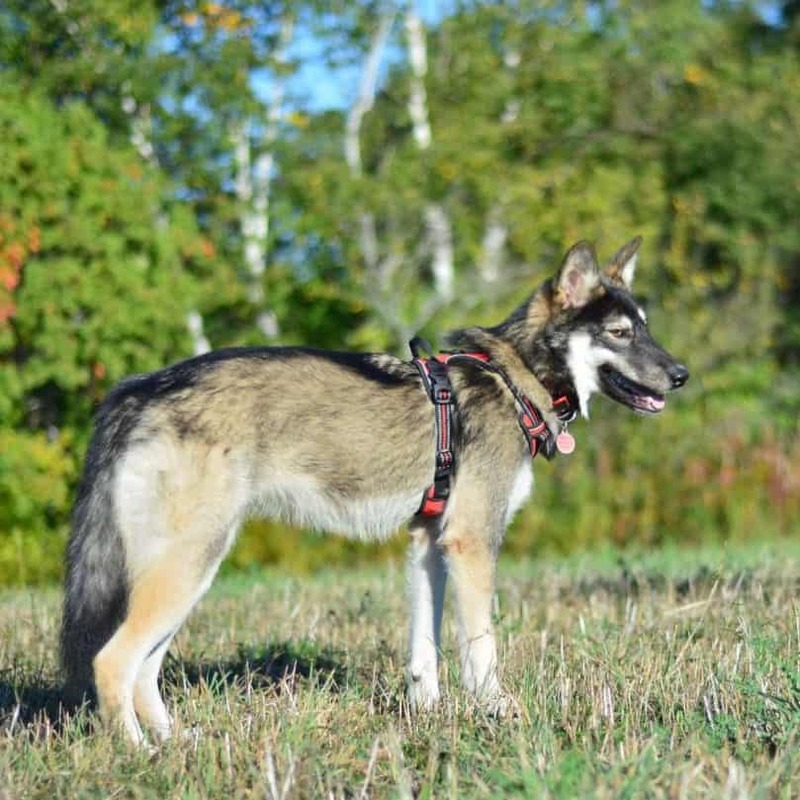 These two sites have a selection of Huskies, Malamutes, and wolfdog mixes. It’s not a guarantee that they’ll have available Wolamutes right now. For rescue and adoption websites, visit Domestic Sale, Puppy Finder, and Lake Tahoe Wolf Rescue. If you can’t find exactly what you’re looking for from these resources, why not consider adopting or buying a different wolf-like breed? Didn’t like any of those breeds? Check out even more dogs that look like wolves. Someone who loves being outdoors and exercises often! Successful Wolamute owners must provide constant stimulation and proper, firm training on a daily basis. Unsuccessful Wolamute owners live in small apartments (or houses without a yard) and are typically first-timers who are inexperienced in dog training. This crossbreed is not for everybody, but comment below if you think this dog is right for you!